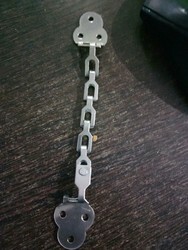 M 2155 STRAIGHT BOLT 6", 8"
M 2162 DOOR CHAIN 6"
We are offering superior quality Door Chain which is highly demanded in the market. The offered products fulfill the requirements of customers because it is available in various sizes. We are highly recommended in the market for providing these products at reasonable rates. We are known in the industry for our timely delivery. To serve the requisite requirements of our precious customers, we are engaged in providing a qualitative range of Door Chain. Assuring complete safety, our range of gate latches is durable in quality. These latches are made from high quality iron. 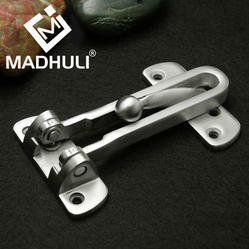 Available in different designs, these latches can match any kind of iron made gates. We are also making door lock chains in Iron, Steel & Brass. The company is known as one of the reliable Manufacturers, Exporters and Suppliers of Door Chains in Aligarh (India). The Door Chains, offered by the company, are made from the best grade raw material. The Door Chains are widely demanded by the clients due to their excellent quality and long service life.